Location: Emory University - Atlanta, G.A. Welcome to Atlanta, Georgia! It is our humble honor and pleasure to welcome you to the third annual American Mock World Health Organization conference in the United States. This past year, a new AMWHO chapter was found here at Emory University. From creating this new chapter, to directing the conference and serving on the Dias for the first ever AMWHO Regional Conference, we have both witnessed this groundbreaking organization academically enrich students and professionals from various academic backgrounds. First and foremost, we are extremely grateful to our National President Neha Acharya for providing us with this Model WHO framework. As co-directors of this national conference, we look forward to the discussion of this conference, and sincerely hope that it will serve to be a platform upon which new innovations in the fields of public health and health diplomacy can be built. Our objective in creating the 2016 AMWHO National Conference is to allow you to apply your pre-existing knowledge and supply you with the chance to engage in a decisive debate that results in a palpable policy change. In order to achieve this goal, we will provide you with the required materials, instructions, and mentorship to easily transition into your assigned position stance during the conference. We hope that this forum presents you with the opportunity to learn about the challenges and exciting developments of working to optimize the health conditions of million around the globe. We are incredibly excited to announce the theme for AMWHO 2016 - Antimicrobial Resistance, a rapidly emerging topic that even science cannot yet fully tackle. Therefore, it is your chance to employ your creativity and co-operation in structuring a resolution that addresses this issue to its furthest scopes. To expand upon this theme, the conference focuses on several subthemes that will be explained in greater detail in the theme brief. With the World Health Organization’s first World Antibiotic Awareness Week being held in November 2015, we hope you perceive this conference as your opening to challenge and expand the resolution created by the World Health Organization. Without enthusiastic participants and professionals such as yourself, AMWHO 2016 would carry no echo of the honest, progress-seeking voices that exist in the World Health Assembly. In addition, our passionate secretariat, a team of bright minds from a diverse assortment of disciplines, is dedicated in reflecting its potentials upon your conference experience. For questions, comments, or concerns, do not hesitate to contact us at general@amwho.org. This is your opportunity to take advantage of a simulated WHO environment to engrain new skills while enjoying the historically rich yet metropolitan capital of Georgia. We are excited to welcome you to our campus in a few short weeks! Nivedita Potapragada is a second year student at Emory, double majoring in Human Health and Economics with a concentration in Health Policy. Nivedita is extremely passionate about public health and medicine, and intends to pursue an MD/MPH in the future. She served as the Co-Director of Internal Logistics for the first AMWHO Regional Conference at Emory this past year. During this national conference, she hopes to learn from and work with the delegates at the conference to spark conversations about global health and health diplomacy. She is incredibly excited to serve as Co-Executive Director of the National Conference 2016, and to welcome you to the beautiful Emory campus! Mansi Maini is a Junior at Emory University majoring in Neuroscience and Sociology. Mansi is the Founder and current Co-President of the AMWHO Emory Chapter. Growing up in New York City, Mansi has been surrounded by people of various cultures, values and socioeconomic backgrounds, which have fostered her interest towards pursuing careers Medicine and Health Policy after her undergraduate education. Her interest in studying and ensuring effective policies are implemented across the globe to bring healthcare towards populations in need sparks her dedication towards AMWHO. Finally, in her free time, Mansi enjoys Fencing and Reading. Somnath Das is a Senior Studying Neuroscience & Behavioral Biology and Chemistry. Growing up in rural Georgia, Somnath enjoys studying how healthcare is distributed within a society, and thus AMWHO serves a way for him to share this passion with others. 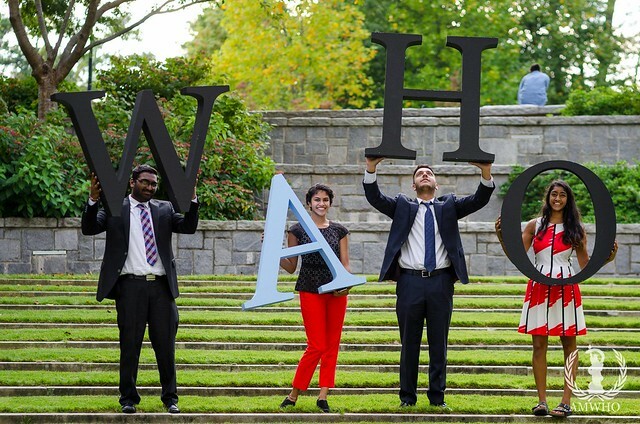 Last year, Somnath served as the Founder of the AMWHO Emory Chapter. During his free time, he enjoys working out and watching his favorite show, Game of Thrones. Sakshee Sunil Sarrawgi is the Media Director for AMWHO 2016. She is currently a sophomore pursuing a double major in Business and Economics at Emory University. She is particularly interested in global health as she feels that everyone has the right to a standard of living adequate for themselves and their families, but there are health disparities all around the globe. We still need the right allocation of resources and research in order to make health affordable and accessible to all. Being a part of the AMWHO’s very first regional conference had been an amazing experience for her and now she is even more thrilled for this year’s national conference. Outside of AMWHO, Sakshee enjoys playing badminton, cooking and photographing. She is looking forward to coming together and discussing important global issues with like-minded individuals who share the same passion and commitment to create a sustainable change. Born and raised in New York City, Sandeep has always been surrounded by vast diversity. This upbringing has primed him to always view problems on a global level, and to think of how widespread issues can be. He plans on pursuing an M.D./M.B.A dual degree and eventually going into medical administration and global health. His immense interest in the life sciences, economics, and global health sparked his interest to join AMWHO, and he hopes to learn just as much from AMWHO events as delegates do. Ashwini Krishnamurthy is a second year student at Emory, born and raised in Rolla, Missouri. She is serving as the Co-Director of External Logistics for the AMWHO 2016 National Conference Executive Board. With passion for community service and an interest pursuing a double major Finance in Human Health, Ashwini believes that her role in AMWHO gives her an outlet to combine her interdisciplinary interests in a way that allows her develop personally and professionally. Ashwini aspires to study Public Health and Business after her undergraduate studies to in order to help build self-sustaining health systems globally. She is enthusiastic about serving as the Co-Director of External Logistics, as it is an opportunity for her to help create an enjoyable and immersive conference to help future healthcare workers become more educated on policymaking and the interworking of the World Health Organization. Lillian Flannigan is an Epidemiology MPH student at Rollins School of Public Health and is interested in international immunization policy and vaccine-preventable diseases. She’s from Oklahoma and is an University of Oklahoma alumna, where she studied microbiology and French and watched a lot of football games (Boomer Sooner!). She first got involved with AMWHO after a last-minute decision to go to AMWHO 2015 with Neha where she represented the Republic of Niger. After serving on the dais for the first AMWHO Emory Georgia Regional Conference, she is very excited to serve as Dais Director for AMWHO 2016, and really hopes to see all of you there! Kristi Kwok is a second year from Livingston, New Jersey and is the Co-Director of Finance for the upcoming National AMWHO Conference. Currently, she is pursuing a double major in Human Health and Business Administration with my main interests in health policy or health care administration. After serving as a committee member for the Regional Conference, she is excited to heighten my involvement in AMWHO by applying her interests to help create a unique and successful conference for all the delegates. Sarah is a recently declared anthropology major who hopes to also minor in global health. She joined AMWHO because of her passion for NGO work as well as public health. She is excited to be a part of an organization that combines her passion for diplomacy and global health and to work as PR co-director to help in the success of the national conference. Sujith Swarna is a sophomore at Emory from the Bahamas, working towards a BS in Biology and BA in Philosophy. As the Sponsorship Director of AMWHO Emory, Sujith feels that AMWHO gives him the ability to learn new and very useful skills and improve in other areas not necessarily related to the pre-med track he's following. Outside of AMWHO, Sujith loves to play his guitar and piano. Katya Bobrek is the Co-Director for Internal Logistics. She is a sophomore and a prospective Anthropology and Human Biology major, Global Health minor. She joined AMWHO because she loves creating a platform to debate current global health issues, and she is proud to be a part of the AMWHO National Conference 2016. Rohan Yarlagadda is a sophomore at Emory University. Originally from New Jersey, he has also lived in Hyderabad, India for the past 6 years, which has given him an international background. He served as the Co-Director of Internal Logistics for the first AMWHO regional conference and will be returning to this position for the AMWHO 2016 National Conference! Working with AMWHO provided him the perfect opportunity to combine two of his passions – debate and medicine. Healthcare is very important to him, and his ultimate goal is to become a doctor. To see it being discussed with such enthusiasm and genuine care brings him great joy and he loves being involved in an organization that actively seeks to discuss pressing global health issues and current medical dilemmas. Apart from medicine and debate, he is also an avid reader (LOTR, anybody?) and writer – he has also been published in a book! he sings and plays the guitar; he absolutely loves music! He looks forward to getting to know you all and working to bring you an incredible AMWHO conference, where you can learn, debate, discuss and inspire! Dr. Weiss and his research team focus on resistance to the last-line polymyxin antibiotics, which are now increasingly used to treat Gram-negative bacteria that are refractory to all other antibiotics. Unfortunately, resistance to the polymyxins has emerged and is also increasing. The team has identified several novel genes that contribute to polymyxin resistance in diverse bacteria, elucidating their mechanisms of action. Furthermore, Dr. Weiss and his research team have also shown the development of resistance to the highly cationic polymyxins in treated patients leads to cross-resistance to cationic host antimicrobial peptides. This raises the possibility that clinical treatment with polymyxins may in some cases select for bacteria with increased virulence. With the knowledge gained from these studies, Dr. Weiss and his research team aim to block antibiotic resistance mechanisms and restore the utility of these drugs. Arjun Srinivasan, MD, is associate director for healthcare-associated infection prevention programs in the Division of Healthcare Quality Promotion at CDC’s National Center for Emerging and Zoonotic Infectious Diseases. Dr. Srinivasan is also a captain in the US Public Health Service. An infectious disease doctor, Dr. Srinivasan oversees several CDC programs aimed at eliminating healthcare associated infections and improving antibiotic use. For much of his CDC career, Dr. Srinivasan ran the healthcare outbreak investigation unit, helping hospitals and other healthcare facilities track down bacteria and stop them from infecting other patients. Dr. Srinivasan works to stop antibiotic resistance by helping doctors improve use of antibiotics. He directs CDC’s efforts to help doctors and administrators improve individual, facility, and network prescribing. His team worked with the Institute of Healthcare Improvement to develop a tool for facilities across the country to improve antibiotic prescribing and reduce errors. These tools will be expanded in the future to make it even easier for users to assess and improve prescribing. As assistant professor of medicine in the Infectious Diseases Division at the Johns Hopkins School of Medicine and a staff physician, Dr. Srinivasan founded the Johns Hopkins Antibiotic Management Program. He carried his passion for combatting antibiotic resistance to CDC where he leads the “Get Smart” program that teaches patients and clinicians alike what they need to know to ensure antibiotics are used appropriately. The program aims to forestall a future in which microbes resist antibiotic treatment. Lauri Hicks, DO is a medical epidemiologist in the Division of Healthcare Quality Promotion, National Center for National Center for Emerging and Zoonotic Infectious Diseases, Centers for Disease Control and Prevention (CDC). She is also a Captain in the US Public Health Service. Dr. Hicks attended medical school at the Philadelphia College of Osteopathic Medicine and completed her internal medicine and chief medicine residencies at the University of Connecticut. This was followed by a 2-year position as an Epidemic Intelligence Service Officer at CDC. After completing a postdoctoral fellowship in infectious diseases at Brown University, Dr. Hicks returned to CDC to lead respiratory outbreak response and the Legionnaires’ disease program. In 2008, she became the medical director for the “Get Smart: Know When Antibiotics Work” program, which aims to educate healthcare providers and the public about appropriate antibiotic use. She leads research on antibiotic use and resistance trends and serves as the campaign spokesperson. Globally she has fostered CDC, European Union, and World Health Organization collaboration leading to joint antibiotic awareness observances. Dr. Hicks has published numerous articles in peer-reviewed journals and has guided national antibiotic stewardship policy and guideline development. In 2015, she became the director for CDC’s Office of Antibiotic Stewardship in the Division of Healthcare Quality Promotion to improve integration of stewardship across the healthcare continuum. She is an Adjunct Assistant Professor of Medicine at the Warren Alpert Medical School of Brown University. Her areas of concentration include respiratory diseases, outbreak investigations, and antibiotic resistance and use. James P. Steinberg, MD, is currently a professor of medicine in the Division of Infectious Diseases, chief medical officer at Emory University Hospital Midtown, and associate dean of clinical services at Emory University Hospital Midtown. At Emory University, Dr. Steinberg is a lecturer in the Medical Pharmacology course as well as a mentor for the Problem-Based Learning course. In the graduate program, he organizes weekly ID case conferences, teaches the Infectious Diseases Fellows didactic course, and is an annual lecturer at Medical Grand Rounds. Dr. Steinberg’s research interests include antibiotic resistance and the epidemiology and prevention of healthcare associated infections, including surgical-site infections and intravascular device-related infections. He was presented the 2015 Beeson Award for serving 26 years on the Division of Infectious Diseases faculty, with contributions to patient care, medical education, hospital epidemiology, quality, and hospital administration. Carlos del Rio, MD is the Hubert Professor and Chair of the Department of Global Health at the Rollins School of Public Health and Professor of Medicine in the Division of Infectious Diseases at Emory University School of Medicine. He is also Program Director of the Emory AIDS International Training and Research Program and co-Director of the Emory Center for AIDS Research (CFAR). Dr. del Rio was Chief of the Emory Medical Service at Grady Memorial Hospital from 2001 - 2009. His research interests include the epidemiology of opportunistic infections in HIV and other immune deficiencies the epidemiology and transmission dynamics of HIV and other sexually transmitted diseases and issues related to early diagnosis of HIV, access to care and compliance with antiretrovirals. In addition, he is the Principal Investigator for the HPTN in site leader for the ACTG in Atlanta. Dr. del Rio's research efforts focus on access to care and barriers to care among HIV-infected persons in the United States as well as healthcare resource utilization by HIV-infected patients. He also does epidemiologic research on opportunistic infections and HIV/AIDS-associated risk behaviors as well as adherence and the impact of therapy on behavior. Finally, he is interested in the spectrum and impact of AIDS in developing countries and issues related to access to care in resource poor settings. Dr. Meier’s interdisciplinary research—at the intersection of international law, public policy, and global health—examines human rights frameworks for global health governance. Advancing rights-based frameworks for public health, he has written and presented extensively on the development, evolution, and implementation of human rights. Within the Department of Public Policy, Dr. Meier teaches undergraduate and graduate courses in Global Health Policy, Health & Human Rights, and Justice in Public Policy. With human rights rapidly evolving as a normative framework for global health policy, Dr. Meier taken an active role in policy discourse to improve global health and has served as a consultant to international organizations, national governments, and nongovernmental organizations. The Emory Antibiotic Resistance Center’s goals include learning how antibiotic resistance develops, optimizing the way antibiotics are used to preserve their power, and discovering novel therapeutics and vaccines to directly combat antibiotic-resistant pathogens. Solving the crisis of antibiotic resistance requires a multi-faceted approach that crosses traditional boundaries. The EARC has generously helped develop the theme of the third AMWHO National Conference while increasing awareness of AMR issues. In a time when we enjoy the greatest knowledge of health in human history, individuals in our society are experiencing a declining trend in health and well-being. The Emory Center for the Study of Human Health was developed to help close that gap by expanding health knowledge in conjunction with the goal of AMWHO, and translating this knowledge to all aspects of life – for the individual and populations as a whole. The Gillings Global Gateway™ works to promote the Gillings School’s global activities in research, teaching and service by fostering multisectoral high-impact partnerships, training the next generation of global health leaders, and turning research into real-world solutions”. The Gillings Global Gateway’s theme on turning research into real-world solutions strongly complements AMWHO’s overall objective of creating realistic resolutions to address pressing global health issues. The Emory Global Health Institute helps Emory University improve health around the world by supporting Emory faculty members and students engaged in a variety of global health research, scholarship, service, and training activities. EGHI is working with AMWHO on a program with a focus on a specific global health issue around the world, to bring visiting global health scholars to Emory, and recognize previous achievements in the field. These special projects help us both improve health around the world and foster the global health community at Emory.